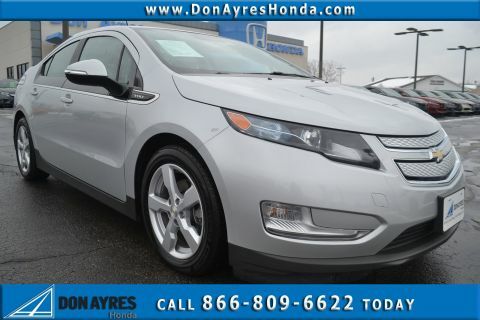 2015 Chevrolet Volt Base ***Warranty***, Fantastic condition, Fantastic fuel economy, ***Just serviced***, Remote Start. 35/40 City/Highway MPG Awards: * 2015 IIHS Top Safety Pick * 2015 KBB.com 10 Best Green Cars * 2015 KBB.com Best Buy Awards Don Ayres Honda, voted "Best Place to Buy a Certified Used Car:. 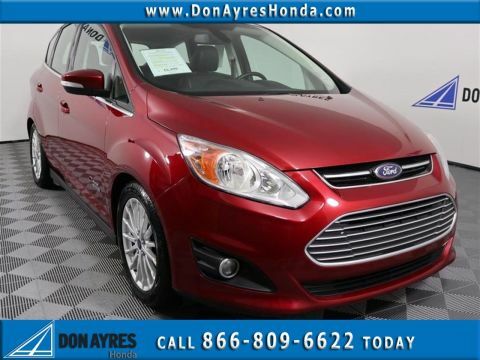 2016 Ford C-Max Energi SEL ***Warranty***, ***Low miles***, Fantastic condition, Fantastic fuel economy, Back up camera, ***Just serviced***, Heated Leather seats, Don Ayres Honda voted best place to buy a used car. 40/36 City/Highway MPG Awards: * 2016 KBB.com Brand Image Awards Don Ayres Honda, voted "Best Place to Buy a Certified Used Car:. 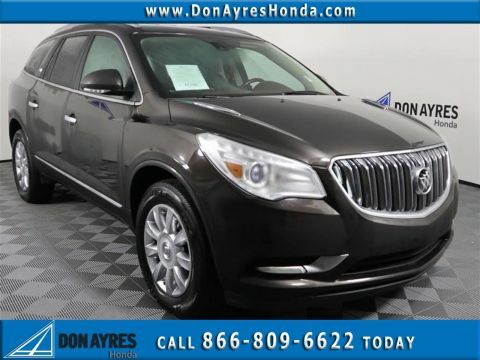 2014 Buick Enclave Leather Group ***Local trade***, Capt Chairs, 3rd Row seat, Fantastic condition, Fantastic fuel economy, Back up camera, ***Just serviced***, Heated Leather seats, Garage Kept, Complimentary 3 month 3,000 miles Limited Powertrain Warranty, Remote Start, 8-Way Power Driver Seat Adjuster, 8-Way Power Passenger Seat Adjuster, Heated Driver & Front Passenger Seats, Memory Settings, Preferred Equipment Group 1SL, Side Blind Zone Alert w/Cross Traffic Alert. Awards: * 2014 KBB.com 5-Year Cost to Own Awards * 2014 KBB.com 10 Best Luxury Cars Under $40,000 * 2014 KBB.com Brand Image Awards Don Ayres Honda, voted "Best Place to Buy a Certified Used Car:. 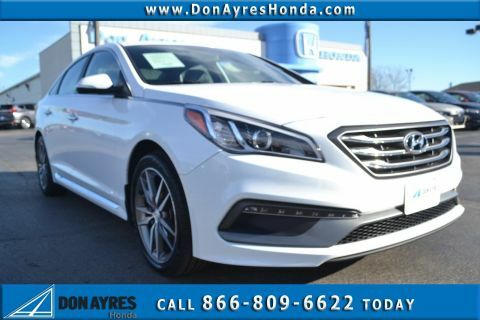 2015 Hyundai Sonata Sport 2.0T ***Warranty***, Fantastic condition, Fantastic fuel economy, Back up camera, ***Just serviced***, Heated Leather seats, Sporty. 23/32 City/Highway MPG Awards: * 2015 KBB.com 15 Best Family Cars * 2015 KBB.com 10 Best Sedans Under $25,000 Don Ayres Honda, voted "Best Place to Buy a Certified Used Car:. 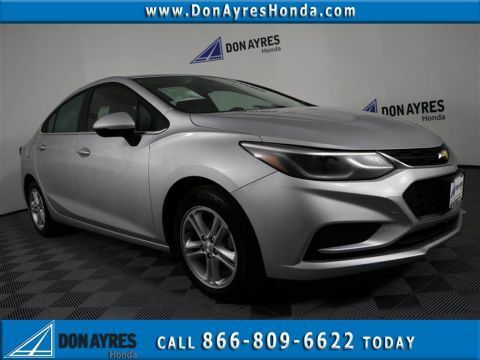 2018 Chevrolet Cruze LT ***Local trade***, ***Warranty***, Fantastic condition, Fantastic fuel economy, Back up camera, ***Just serviced***, Garage Kept, Don Ayres Honda voted best place to buy a used car. 29/40 City/Highway MPG Don Ayres Honda, voted "Best Place to Buy a Certified Used Car:. 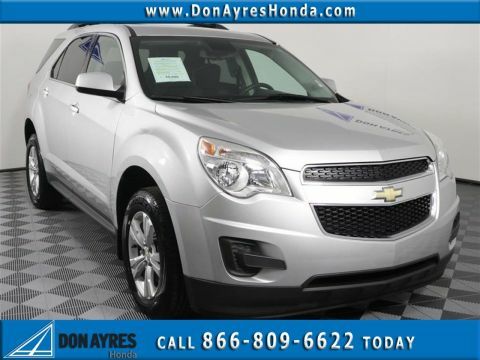 2016 Chevrolet Equinox LT AWD ***Warranty***, Fantastic condition, Fantastic fuel economy, Back up camera, ***Just serviced***, Don Ayres Honda voted best place to buy a used car. 20/29 City/Highway MPG Awards: * JD Power Initial Quality Study * 2016 IIHS Top Safety Pick with optional front crash prevention * 2016 IIHS Top Safety Pick Don Ayres Honda, voted "Best Place to Buy a Certified Used Car:. 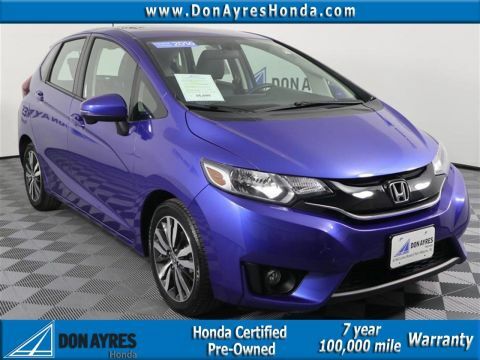 2016 Honda Fit EX-L ***Free 100k Mile Warranty***, Sunroof / Moonroof, ***Low miles***, Fantastic condition, ***Honda Certified***, Fantastic fuel economy, Back up camera, ***Just serviced***, Heated Leather seats, Don Ayres Honda voted best place to buy a used car. 32/38 City/Highway MPG Certified. Honda Certified Pre-Owned Details: * 182 Point Inspection * Warranty Deductible: $0 * Vehicle History * Limited Warranty: 12 Month/12,000 Mile (whichever comes first) after new car warranty expires or from certified purchase date * Transferable Warranty * Powertrain Limited Warranty: 84 Month/100,000 Mile (whichever comes first) from original in-service date * Roadside Assistance with Honda Care purchase Awards: * JD Power Vehicle Dependability Study * ALG Residual Value Awards * 2016 KBB.com Best Resale Value Awards Subcompact Car * 2016 KBB.com Brand Image Awards 2016 Kelley Blue Book Brand Image Awards are based on the Brand Watch(tm) study from Kelley Blue Book Market Intelligence. Award calculated among non-luxury shoppers. For more information, visit www.kbb.com. Kelley Blue Book is a registered trademark of Kelley Blue Book Co., Inc. Don Ayres Honda, voted "Best Place to Buy a Certified Used Car:. 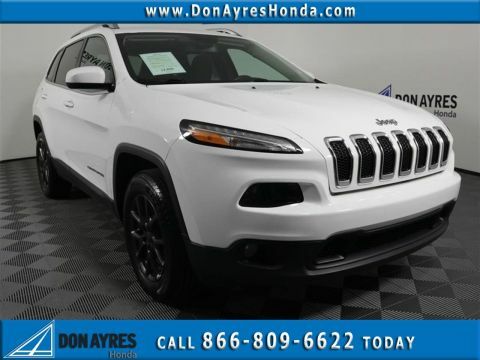 2016 Jeep Cherokee Latitude Altitude 4WD ***Warranty***, Fantastic condition, Fantastic fuel economy, Back up camera, ***Just serviced***, Sporty. Don Ayres Honda, voted "Best Place to Buy a Certified Used Car:. 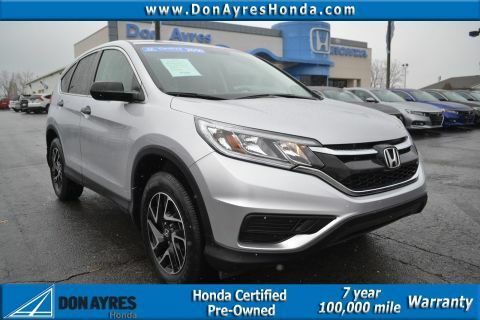 2016 Honda CR-V SE ***Local trade***, ***Low miles***, Fantastic condition, ***Honda Certified***, Fantastic fuel economy, Back up camera, ***Just serviced***, Don Ayres Honda voted best place to buy a used car. 26/33 City/Highway MPG Certified. Awards: * 2016 IIHS Top Safety Pick+ (With Touring Model) * ALG Residual Value Awards * 2016 KBB.com Brand Image Awards 2016 Kelley Blue Book Brand Image Awards are based on the Brand Watch(tm) study from Kelley Blue Book Market Intelligence. Award calculated among non-luxury shoppers. For more information, visit www.kbb.com. Kelley Blue Book is a registered trademark of Kelley Blue Book Co., Inc. Don Ayres Honda, voted "Best Place to Buy a Certified Used Car:. 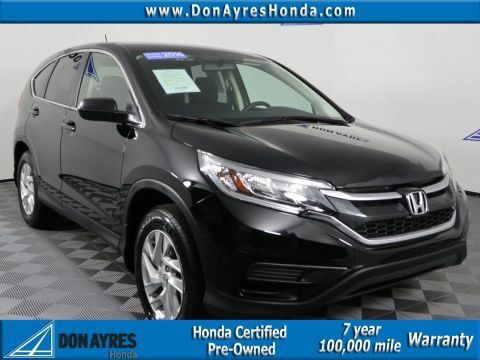 2016 Honda CR-V SE AWD ***Local trade***, ***Free 100k Mile Warranty***, ***Low miles***, Fantastic condition, ***Honda Certified***, Fantastic fuel economy, Back up camera, ***Just serviced***, Garage Kept, Don Ayres Honda voted best place to buy a used car. 26/33 City/Highway MPG Certified. Honda Certified Pre-Owned Details: * Roadside Assistance with Honda Care purchase * Limited Warranty: 12 Month/12,000 Mile (whichever comes first) after new car warranty expires or from certified purchase date * Vehicle History * Powertrain Limited Warranty: 84 Month/100,000 Mile (whichever comes first) from original in-service date * Transferable Warranty * 182 Point Inspection * Warranty Deductible: $0 Awards: * ALG Residual Value Awards * 2016 IIHS Top Safety Pick+ (With Touring Model) * 2016 KBB.com Brand Image Awards 2016 Kelley Blue Book Brand Image Awards are based on the Brand Watch(tm) study from Kelley Blue Book Market Intelligence. Award calculated among non-luxury shoppers. For more information, visit www.kbb.com. Kelley Blue Book is a registered trademark of Kelley Blue Book Co., Inc. Don Ayres Honda, voted "Best Place to Buy a Certified Used Car:. 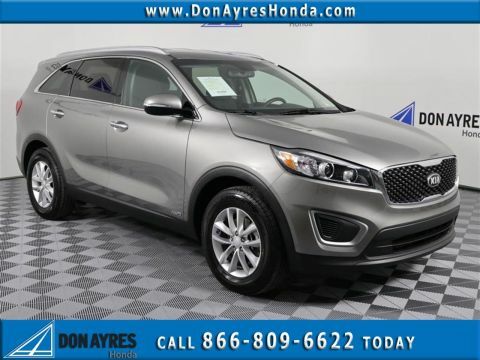 2017 Kia Sorento LX AWD ***Local trade***, ***Warranty***, ***Low miles***, Fantastic condition, Fantastic fuel economy, Back up camera, ***Just serviced***, Heated Cloth Seats, Garage Kept, Don Ayres Honda voted best place to buy a used car. Awards: * JD Power Initial Quality Study (IQS) * 2017 KBB.com 10 Most Awarded Brands Don Ayres Honda, voted "Best Place to Buy a Certified Used Car:. 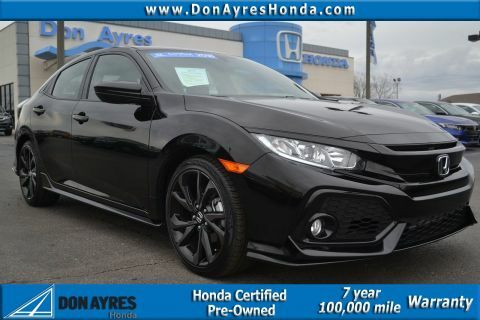 2018 Honda Civic Sport ***Free 100k Mile Warranty***, ***Low miles***, Fantastic condition, ***Honda Certified***, Fantastic fuel economy, Back up camera, ***Just serviced***, Sporty. Certified. 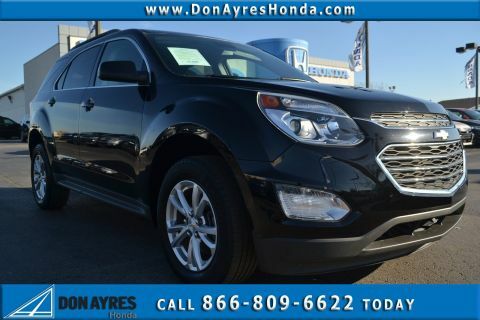 Don Ayres Honda, voted "Best Place to Buy a Certified Used Car:. 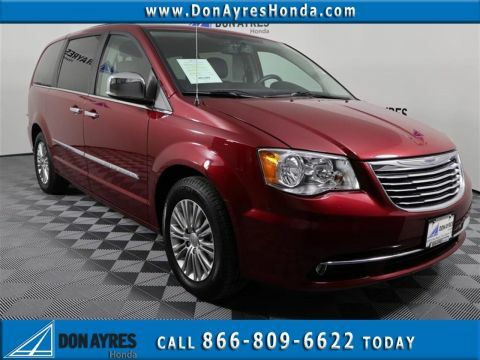 2015 Chrysler Town & Country Touring-L ***Warranty***, Rear Entertainment / DVD Player, Fantastic condition, Fantastic fuel economy, Back up camera, ***Just serviced***, Heated Leather seats, Don Ayres Honda voted best place to buy a used car. 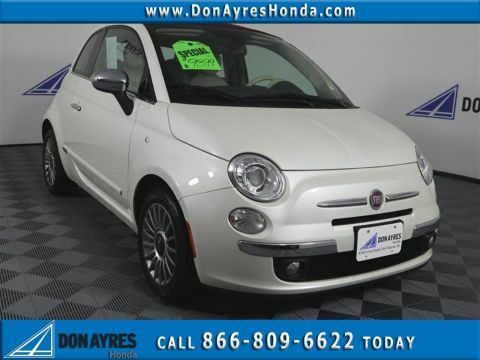 Don Ayres Honda, voted "Best Place to Buy a Certified Used Car:. 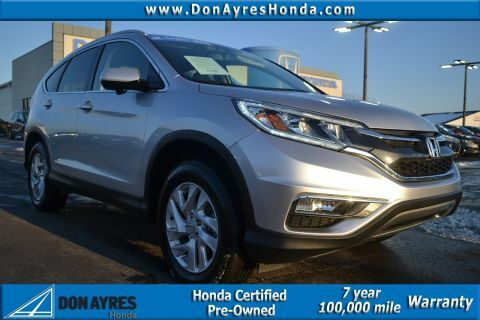 2016 Honda CR-V SE AWD ***Free 100k Mile Warranty***, ***Low miles***, Fantastic condition, ***Honda Certified***, Fantastic fuel economy, Back up camera, ***Just serviced***, Don Ayres Honda voted best place to buy a used car. 25/31 City/Highway MPG Certified. Honda Certified Used Cars Details: * Powertrain Limited Warranty: 84 Month/100,000 Mile (whichever comes first) from original in-service date * Warranty Deductible: $0 * Transferable Warranty * 182 Point Inspection * Vehicle History * Limited Warranty: 12 Month/12,000 Mile (whichever comes first) after new car warranty expires or from certified purchase date * Roadside Assistance Awards: * ALG Residual Value Awards * 2016 IIHS Top Safety Pick+ (With Touring Model) * 2016 KBB.com Brand Image Awards 2016 Kelley Blue Book Brand Image Awards are based on the Brand Watch(tm) study from Kelley Blue Book Market Intelligence. Award calculated among non-luxury shoppers. For more information, visit www.kbb.com. Kelley Blue Book is a registered trademark of Kelley Blue Book Co., Inc. Don Ayres Honda, voted "Best Place to Buy a Certified Used Car:. 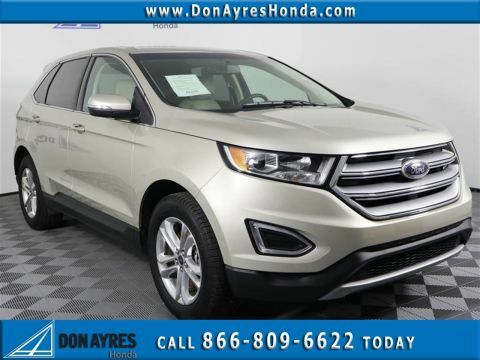 2017 Ford Edge SEL AWD ***Local trade***, ***Warranty***, ***Low miles***, Fantastic condition, Fantastic fuel economy, Back up camera, ***Just serviced***, Heated Leather seats, Garage Kept, Don Ayres Honda voted best place to buy a used car. 20/27 City/Highway MPG Awards: * 2017 KBB.com 10 Most Awarded Brands * 2017 KBB.com Brand Image Awards Don Ayres Honda, voted "Best Place to Buy a Certified Used Car:. 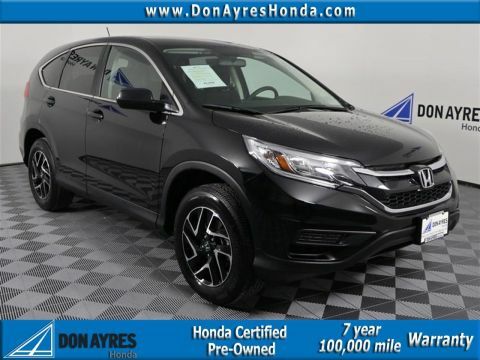 2016 Honda CR-V EX-L AWD ***Local trade***, ***Free 100k Mile Warranty***, Sunroof / Moonroof, Fantastic condition, ***Honda Certified***, Fantastic fuel economy, Back up camera, ***Just serviced***, Heated Leather seats, Garage Kept, Don Ayres Honda voted best place to buy a used car. 25/31 City/Highway MPG Certified. Honda Certified Used Cars Details: * Vehicle History * Limited Warranty: 12 Month/12,000 Mile (whichever comes first) after new car warranty expires or from certified purchase date * Roadside Assistance * Warranty Deductible: $0 * Transferable Warranty * 182 Point Inspection * Powertrain Limited Warranty: 84 Month/100,000 Mile (whichever comes first) from original in-service date Awards: * 2016 KBB.com Brand Image Awards 2016 Kelley Blue Book Brand Image Awards are based on the Brand Watch(tm) study from Kelley Blue Book Market Intelligence. Award calculated among non-luxury shoppers. For more information, visit www.kbb.com. Kelley Blue Book is a registered trademark of Kelley Blue Book Co., Inc. Don Ayres Honda, voted "Best Place to Buy a Certified Used Car:. 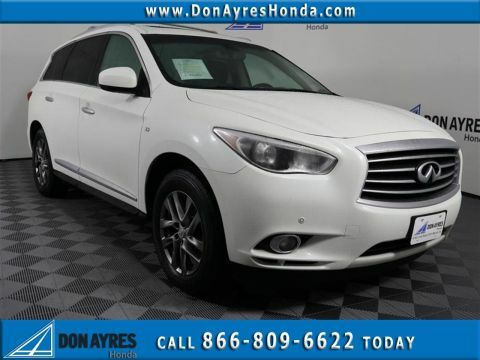 2015 INFINITI QX60 AWD ***Warranty***, Sunroof / Moonroof, 3rd Row seat, Navigation, Fantastic condition, Back up camera, ***Just serviced***, Heated Leather seats, Don Ayres Honda voted best place to buy a used car. 19/26 City/Highway MPG Awards: * 2015 IIHS Top Safety Pick Don Ayres Honda, voted "Best Place to Buy a Certified Used Car:. 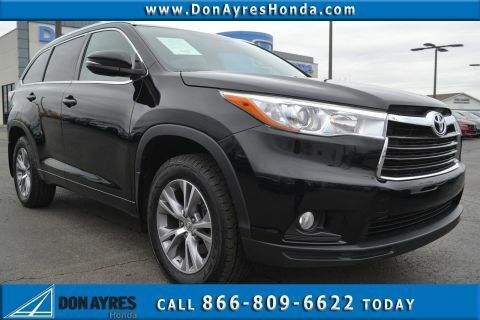 2015 Toyota Highlander XLE V6 AWD ***Warranty***, Sunroof / Moonroof, 3rd Row seat, ***Low miles***, Navigation, Fantastic condition, Fantastic fuel economy, Back up camera, ***Just serviced***, Heated Leather seats, Don Ayres Honda voted best place to buy a used car. Awards: * 2015 IIHS Top Safety Pick+ * 2015 KBB.com 10 Most Fuel-Efficient SUVs * 2015 KBB.com Best Buy Awards * 2015 KBB.com 15 Best Family Cars Don Ayres Honda, voted "Best Place to Buy a Certified Used Car:.